Politicians of both parties disregarded taxpaying citizens and catered to special interests and lobbyists. In the 2016 presidential election, Donald Trump tapped into the anger and resentment felt by voters in Rust Belt states and throughout America. As a result, he defeated an impressive field of 16 GOP presidential candidates and seized the nomination from the party’s establishment that hated him. In the general election, he defeated a candidate what was supported by the deep state, the media, Hollywood, the special interests, the establishment wing of the Republican Party and the corrupt Democratic Party machine. Despite spending twice as much money as Donald Trump, being improperly exonerated for likely criminal behavior by the FBI and receiving far favorable media coverage, Hillary Clinton lost the popular vote in 30 states and was defeated in an Electoral College landslide. Mr. Moore, “we got in this situation” because Donald Trump won an election that was stacked against him by an overwhelming margin. Like many liberals, Moore is disconnected from reality. He believes the country is “very liberal” and that Americans do not “want the Republicans in the White House! They don’t want them running this country! We’re the majority!” Of course, Moore is totally delusional. If liberals are the majority in the country, why are there 33 Republican governors? Why does the GOP control both houses of Congress? Politically, America is a center-right nation, not a country with a majority of leftists who want high taxes, ever expanding government programs, open borders and socialized medicine. As President, Donald Trump has cut taxes and needless regulations, resulting in an improving economy and an increasing approval rating among the American people. Despite the good economic news, Moore believes that Trump is a danger to America and needs to be removed from office. On The Late Show with Stephen Colbert, Moore claimed that he cries every day while watching the news. Supposedly, this anger drove Moore to target Trump with this documentary. In reality, Moore knows that this film will be celebrated by Hollywood and the media. The hype will allow Moore to profit, while taking advantage of the deranged liberal hatred for Donald Trump that is rampant among the Democratic Party. The new documentary will feature a hard-left message, in keeping with Moore’s history. With such a pedigree, it is inconceivable to believe that many non-liberals will spend their hard-earned money to watch this latest Moore attempt to rewrite history. He will not be convincing many swing voters or Independents, just preaching to the choir. According to Moore, "the only way we're going to stop this is that we're going to have to put our bodies on the line." 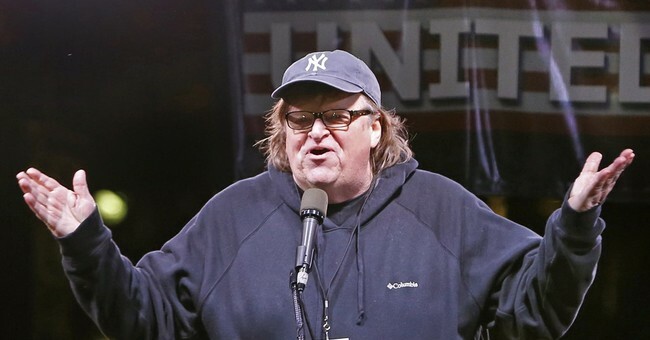 Presumably, Moore meant his comment to encourage liberals to join protest movements such as shutting down ICE offices and harassing Trump administration officials in restaurants and movie theaters. However, if liberals take Moore’s advice, such activism will surely drive more voters to the Republican Party. It is quite telling that a man who affiliated with a well-known abuser of women is now on a soapbox preaching about the dangers of Donald Trump. Moore is a typical Hollywood hypocrite who is trying to profit from selling a poisonous political message to the American people. Let’s hope the American people follow the good advice of Nancy Reagan and “Just Say No!” to Michael Moore and his new documentary of liberal hate directed against a President duly elected by our nation’s voters.